The Kingdom of Swaziland is a landlocked country bordered by South Africa on the north, west and south, and by Mozambique on the east. 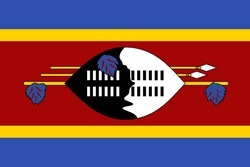 Swaziland is Africa’s smallest nation and the last remaining monarchy. King Mswati II was the king of Swaziland between 1840 and 1868. He was known as "the greatest of the Swazi fighting kings," and Swaziland reached its greatest territorial extent under his reign. Currently the head of state is King Mswati III, who appoints the prime minister and a small number of representatives for both chambers of parliament. The Swazi people descend from the southern Bantu who migrated from Central Africa in the 15th and 16th centuries. Traditionally Swazi have been subsistence farmers and herders, but most now mix such activities with work in the growing urban formal economy and in government. Some Swazi work in the mines in South Africa. The Swazi are a very friendly people and rich in culture, still living very close to their traditional values.